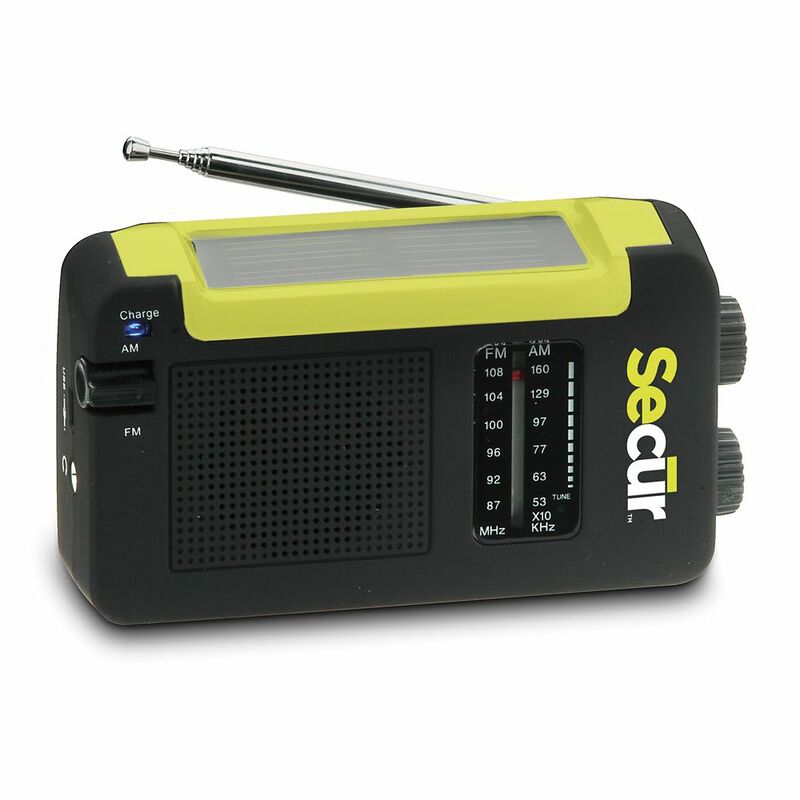 Listen to music or dial in news and weather reports with this multi-function emergency radio from Secur. This compact AM/FM radio never needs batteries and can be charged via the built-in dynamo or solar panel. It also features a headphone jack for personal listening. For rich stereo sound, the Makita Cordless Jobsite Radio delivers with two powerful 3.25 side-firing drivers. Rugged weather resistant case and protective bumper design for job site conditions assures you'll be rockin' job after job. It runs 16 hours on a single Makita Lithium-Ion battery (3.0Ah) charge. A digital backlit quartz display, 10 pre-set FM/AM buttons and dual volume and tuning dial make this radio easy to use. Compatible with slide type and pod style Makita batteries. The M12 Cordless LITHIUM-ION Radio is up to 10 times smaller than existing job site radios. With the introduction of the first digital processor in the category, it delivers the highest reception and signal clarity in the industry. In addition, the M12 Cordless LITHIUM-ION Radio features premium weatherproof aluminum speakers that produce a rich, full sound. With a built in weather sealed MP3 compartment to protect MP3 players and other audio devices connected to the docking portal. Backed by legendary Milwaukee durability, a shock absorbing ABS polymer and steel construction protects internal components from weather and abusive job site conditions. LOUD CLEAR SOUND. BUILT FOR WORK. Featuring a high-performance audio system and rugged design, the M18 Jobsite Radio is built to amplify and survive the jobsite. Dual speakers and passive radiators combine to produce sharp highs, rich mids, and deep bass at all volumes. Durable metal speaker grills and shock absorbing end caps protect from drops and other harmful jobsite conditions while integrated handles allow for easy transport and storage. Listening options include a digital processor with best-in-class reception and signal clarity or a 3.5mm aux jack for wired playback. A weather-sealed auxiliary compartment protects devices and houses a 2.1A USB charging port. The M18 Jobsite Radio is powered by all M18 REDLITHIUM Batteries (sold separately) or A/C power. Hybrid Power Radio Listen to music or dial in news and weather reports with this multi-function emergency radio from Secur. This compact AM/FM radio never needs batteries and can be charged via the built-in dynamo or solar panel. It also features a headphone jack for personal listening. Hybrid Power Radio is rated 4.0 out of 5 by 2. Rated 4 out of 5 by WPR from Pretty Good Solar Radio This radio has a highly efficient solar cell, which charges the battery anytime it is exposed to any kind of light -- sunlight or artificial. I keep it on a windowsill in the bathroom, and have never had to crank it or plug it in, which is the kind of performance I was looking for to replace my old Coleman solar radio, which finally died after many years. My only criticism is that this small radio does not have the greatest speaker, so the sound is poor for music. However, since I mostly use it to listen to talk shows, it is acceptable. My old Coleman solar radio was much larger and heavier, and had a much better sound, but it is unfortunately no longer available.